It’s been a while since I’ve posted a jaw-dropping high-res picture from Mars, so how about this one: a gorgeous shot of frost coating dunes on the surface of the Red Planet? This picture was taken by the HiRISE camera on board the Mars Reconnaissance Orbiter, which takes extremely detailed images of the surface of the planet. It shows wind-driven sand dunes on Mars, rippling in a similar way as on Earth. The sunlight is coming from the upper left direction, and where the light hits the surface you can see the familiar reddish cast; that’s actually from very fine-grain dust laden with iron oxide — rust! But the shadows, where the Sun doesn’t reach, it’s cold enough that carbon dioxide in the Martian air freezes out, forming a thin layer of dry ice on the surface. 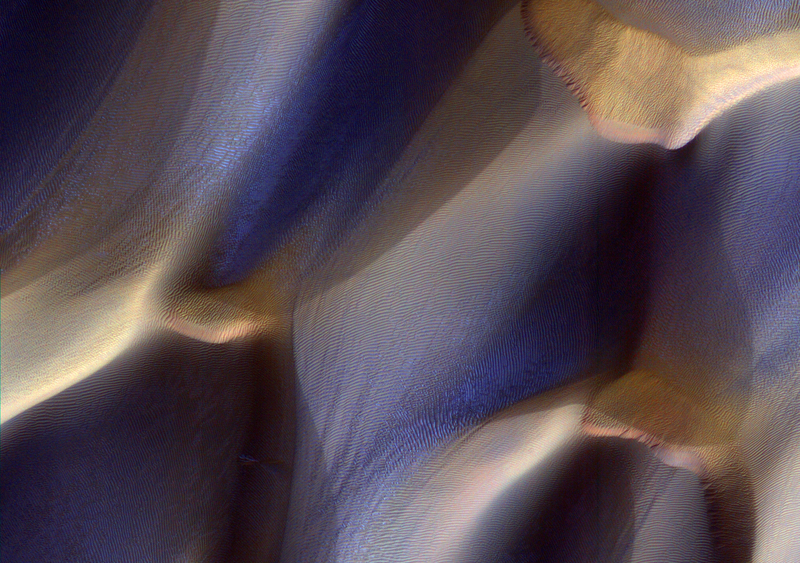 In this image — where the colors have been enhanced so you can see the effects better — this shades the dunes blue. You can see the frost not just covering the dunes in general, but hiding in the troughs of the ripples too (which I think is why the sunward facing parts of the dunes can look blue; that’s from the ripple shadows). The non-color-enhanced version showing the entire dune region can be found here — and is stunning in its own right. These dunes fascinate me. The sand on Mars is actually basaltic, making it look grey to the eye. Those grains are big enough that they don’t move as easily as the finer dust, and they pile up to form the big dunes, with the redder dust coating them. The color can change when frost forms, as in the picture above, but you also get incredibly dramatic and simply stunning patterns when dust devils — tornado-like vortices that form when wind blows over warm air rising off the surface — lift up the red dust and expose the grey basalt underneath. The swirling patterns are intricate and incredible, as you can see in this picture here (click to embiggen and get more details). Pictures like this remind me viscerally that these objects we see in the sky are not just some distant lights, they are whole worlds. They have fantastic details and are as diverse and have complex interactive systems as any we find on Earth. This makes their study important, fascinating… and of course, astonishingly beautiful. Image credit: NASA/JPL/University of Arizona. Tip o’ the heat shield to HiRISE on Twitter. – Happy first day of spring… Mars!